I left you hanging, I know, my bad, but I wanted to be able to detail what I did to make what I thought was the best roast I've done so far. (talk about a convoluted sentence, whew). Every time I make a roast like this, I try to do better, I tweak, I twiddle, I play with my meat, but one thing I've been striving for is to get it perfectly cooked throughout, which to my mind means evenly cooked. My own personal preference is for RARE, but my DH likes his between Medium and Medium Rare. So this last time I did get it pretty close to Medium Rare, well, actually dead on. And I thoroughly enjoyed my piece of meat. I'm really kicking myself but I totally spaced getting a picture of this as it came out of the oven, and I just didn't feel comfortable taking pictures of the meat on the plate as we had guests in that day, so you'll just have to see what I had left of the two rib roast, it was just over 5 pounds. I want to stick in a couple of credits here. I have an old(er) cookbook called Woman's Day Collectors Cook Book, published in 1960. On page 38 there is a recipe for Miracle Roast Beef. It instructs you to place a roast in the oven at 200 deg. and roast it for one hour per pound. And says that it makes a perfect rare roast. I've done it in the past, with a lovely rump roast and it does work. However, I didn't care for the grayness on the outside of the roast. Picky, picky, picky. I know. But I ran across this recipe for a Foolproof Standing Rib Roast on Paula Deens portion of the Foodnetwork site. And decided to make the roast using both methods. (I know, I confuse myself sometimes too). To begin with I prepared a nice little bed of celery stalks and mushrooms for the roast to rest on. I discovered this trick last year, and I think it helped the roast, flavour wise. At any rate the mushrooms were very tasty, giggle. After the roast was cooked, natch. And always roast the meat, rib side down, fat side up. I then took a very sharp knife and shaved some of the fat from the ends of the ribs, and set that aside. I took a small handful of butter and buttered the ends of the roast, yes, I added more fat, I can't believe the layer of flavour that added. I think you could use olive oil as well, but I had the butter out and softened so I used it. I've even seasoned the butter before putting it on. Everything's better with butter. This seals off the ends so they don't dry out as the roast is cooking. Salted and peppered the roast, then placed the shaved off fat on top of the salt and pepper. It bastes the meat, beautifully. Then I placed it in a 375 deg. oven and let it cook for about 45 minutes, at 3 pm, then turned the oven off as per Paula's instructions. However, I didn't have the luxury of time, because I'd been baking a Lemon Meringue pie so I had to fudge the timing a little. I let it sit for about an hour and then turned the oven back on to 200 deg. when the internal temperature hit 100 deg. I wanted to let the temp come up to 130 degrees before I pulled it out of the oven, if the temp looks like it's rising too fast, turn off the oven. I did, then turned it back on again. At about 5:15 I turned the oven up to 425 deg. and let it roast for about half an hour, this gave me a lovely brown on top and more important, made sure the oven was hot enough for the Yorkshire Pudding I was going to put in. I pulled the roast out around 5:45, pardon me for not being more specific, but I had a few things going on at the time. Put it on the cutting board, covered it with some foil and a towel, and let it rest while the Yorkshire Pudding baked and I got the potato's mashed and the gravies made. And by the time I cut it, the internal temp was up to 140 deg. Next time I'll pull the roast at 135 deg. and let it rest til it gets to 145 or a little more, that will give me the Medium that I'll want. At any rate this is all that was left of the roast, and as you can see, the meat was done evenly throughout. It was a lovely piece of meat and we really enjoyed it. The cut side, see how evenly it's cooked? Perfectly cooked, medium rare all the way. I love it when a plan comes together, or is that a recipe comes together? Hmmm, at any rate, if you happen to have a special occasion coming up or just want to try your hand at a Prime Rib roast or find it on sale, lucky person you, go ahead and make this. You won't regret it. And if you happen to have leftovers, there's nothing like a good French Dip sandwich. Oh and the ribs, well, I usually put some good barbeque sauce on them, and stick them back in the oven for a couple of hours and VOILA!!! Fantastic BBQ ribs. Tender, juicy and I have to stop now and go make me something to eat, I made myself hungry. *** I want to update this post. 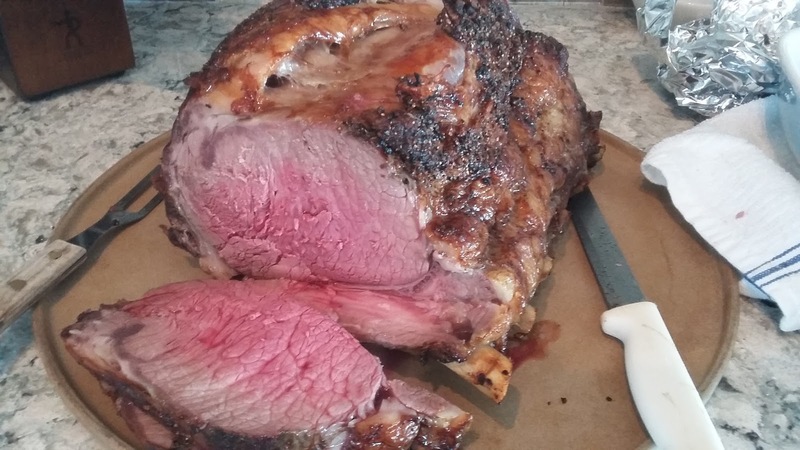 I made another Rib Roast for Valentines Day, cliche I know, but... At any rate I managed to remember to take pictures of it, after removing it from the oven, before I cut it. I did a 12 pound roast last night and followed Paula Deans recipe exactly, and OMG, that roast was perfect. It doesn't seem to matter the size, just the temp and cooking and not touching the oven time. I pulled the roast at 135 degrees and let it set and rest til the internal temp hit 139. Cut it, and it was juicy, tender, flavourful, and I'm NEVER going to cook a rib roast any other way. My guests loved it, my DH loved his piece and we all had a great meal. I made another roast for Christmas Eve this year. This one was 13 pounds, I pulled the roast at 138 deg, and let it rest while I got the rest of the dinner together and visited with my guests. By the time I got the roast cut, the internal temp was up 148 deg. The meat was medium, but very tender and flavourful as well. I like my meat a little rarer than this, but my guests didn't seem to have any problems eating it. I also made some Yorkshire Puddings and they turned out so good. giggle. I'll be sharing the recipe in my regular posts, but for now here's a picture. *****this is a picture of the most recent roast I did. And I think it was the prettiest and best one I've ever cooked.